'Teen Titans Go! To The Movies' Got Everything! We all know DC Comics’ movies to be gritty and unreasonably dark. It is their signature trait- one that identifies them from the lightheartedness of Marvel Studios’ films. But then again, not all of their market are adults. They still have the children and young-at-heart audiences to reach. Make things bright, colorful, and funny then now we have Teen Titans Go! The animated series based off of the Teen Titans title is a long-running show on Cartoon Network. Finally, the team is jumping from the small screen to the big screen! How did it go? Was it necessary? Well, that’s what you’ll find out at the end of this article. 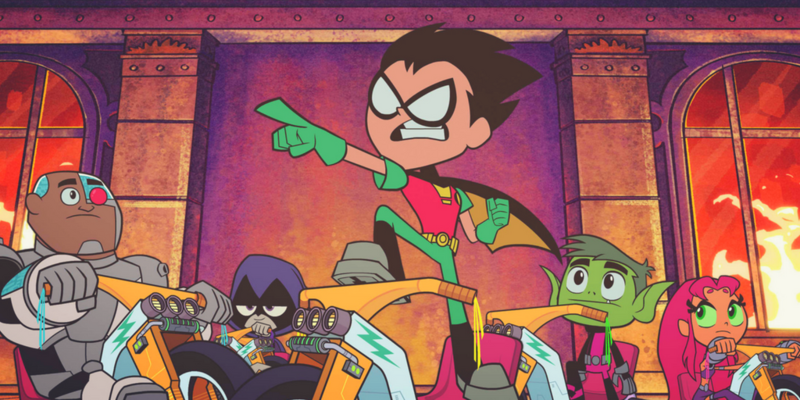 Bingers, here are 3 reasons Teen Titans Go! To The Movies will make you want to, well, actually go to the movies! I am not going to lie here, I have not seen many episodes of Teen Titans Go! in Cartoon Network. Yet I am familiar with its tone. To add, I am not sure how much is the involvement of the whole DC Universe on the show but this I gotta say is put to good use in the movie! Enter Superman, Wonder Woman, Batman, The Flash…whoever you can think of! Almost the majority of DC heroes have made an appearance and some even did more than just a cameo! And yes, brush up on your skills because you might even see some of the obscure ones! Spotting them can be a fun game! Teen Titans Go is a win in this department! It might be a cartoon but the humor is far from becoming childish. True, there are some fart jokes and the likes but it all adds up to the overall charm of the film. Similarly to the TV show, the characters did not hold back in poking fun at the DCEU and even Marvel Comics! Who said Stan Lee can only show up in Marvel movies? It was a riot during the movie. The jokes were spot-on and the breaking of fourth wall is perfect. To a point, it was as if I was watching a sanitized and DC version of Deadpool. While the jokes landed, I have to say that they can be possibly one-off. The effect may not be as funny on the second viewing. But hey, at least they made you laugh the first time, right? Everybody wants to be something else. As for the team, they just want to be taken seriously. In the DCEU where the Justice League exists, the Teen Titans are looked down upon as kids and goofballs. They might have superpowers but their childishness prevents them from being taken seriously. Meanwhile Robin has had enough of hiding behind Batman’s shadows. He wants a movie of his own. And so that served as the motivation for the entire team in the movie. To a point, it felt real and believable. Teen Titans Go! To The Movies is not your awards-bait animated film nor your gritty DC movie. It is the movie that will take you back to your 10-yr old selves on a Saturday morning- hilarious, light, and effortlessly funny! It has the action of a superhero movie, it has the villain that is worthy of screen time, and it has the narrative worthy of a film. If you want to take a break from your usual DC and Marvel movies but still got the craving for some superhero action, Teen Titans Go! To The Movies will actually make you want to, well, go to the movies! It pokes fun at the whole superhero genre film with such a crazy humor. With loads of references and cameos, pop culture fans are up for a treat! Binge-level: 3 out of 5 stars.